! ! ! WANTED ! ! ! WANTED ! ! ! WANTED ! ! ! CURRENTLY LOOKING FOR A WORKING OR NON-WORKING SYSTEM AND LOOSE CARTRIDGES! ! ! ! WANTED ! ! ! WANTED ! ! ! WANTED ! ! ! 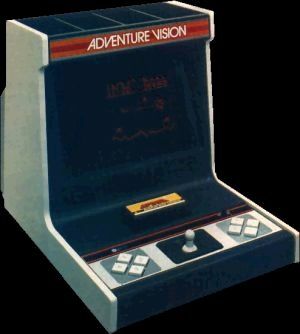 The Adventure Vision is a cartridge based, electronic hand held video game that was manufactured in 1982 by Entex Industries, Inc. The system measures about 13 1/4" X 10" X 9" and uses one vertical strip of 40 red LEDs and a spinning mirror to produce an apparent screen resolution of 150X40(drawn at 15 frames/sec). While there are only four cartridges for this system, those four games are all arcade classics, Defender, Turtles, Super Cobra, and an Asteroids clone, Space Force. UPDATE(09-05-2015): * Added Federico, Brian P. and Alex A. to the Owner's Pride section of the site! * Added a CATALOG PAGE from the 1982 UK Hales Toy Catalog! Thanks Alex!!! COOL INFORMATION: Bob McCaslin's own personal pictures from when he was developing the system... PROTOTYPE ADVENTURE VISION!!! WANTED: I'm looking for magazine articles, instruction manuals, warrantee cards, prototype games/systems, ex-Entex employee system notes, ANYTHING!!! If you have any of the above items, please e-mail me. I have recently had a few requests for system schematics to help in repairs. If you have any schematics for this system, PLEASE let me know. I'd be interested in a photocopy or the originals. Thanks. 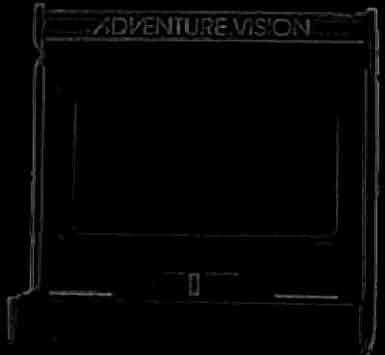 The Adventure Vision binary files needed for MESS can be found by clicking on the "System Info" button to the left and then the "All kinds of technical information." link from there. and is provided for informational purposes only.